Certainly details matter, and flaws in the smallest ones can mar the results of weeks of hard work. The auguries were good for the Boston Classical Orchestra—a compact, albeit powerful, ensemble of some Boston’s finest freelance musicians joining forces to present some truly monumental works. Saturday evening’s program, although not the most challenging, was substantial—a concert of Schubert’s B-flat Major Overture D. 470, Weber’s First Symphony Op. 19 and the Beethoven Violin Concerto Op. 61. For what I presume are both financial and historical reasons, the ensemble performs in Boston’s Faneuil Hall—a venue for historic speeches and home to hundreds of naturalization ceremonies. But under the watchful gazes of Daniel Webster, John Adams and Frederick Douglass, in front of the red, white and blue bunting that adorns the stage, one wondered if issues with balance and cohesion wouldn’t have resolved themselves in a less muddy space. To complain is to be peevish, but the effects were noticeable. Details were not lost to the orchestra, which amply revealed their superb training and grasp of the repertoire. But something significant was lost throughout the evening: sharp contrasts in color and tempo as well as the crisp, almost Mozart-ian lines of Schubert’s overture disappeared in Faneuil Hall. An over-eager timpanist, in collusion with the lower strings and brass, all but obfuscated the Schubert’s melodic lines at some points. The acoustics surprisingly sometimes favored the intricacies of the Schubert’s inner voices—a technical feat for which the orchestra and conductor should certainly be commended. Yet the venue continued to prove problematic in Weber’s symphony. The work is a marvelous drama, weaving opera buffa-like characters into the thread of the music. The ensemble clearly understood the intent of the composer and presented a crisp read of the clever Scherzo movement, but Faneuil Hall’s acoustics required modifications: the tempi dragged; dramatically forceful passages lolled into mere tableaux, and, in general, much of the effect of Weber’s work was lost. Beethoven’s Violin Concerto presented similar challenges. 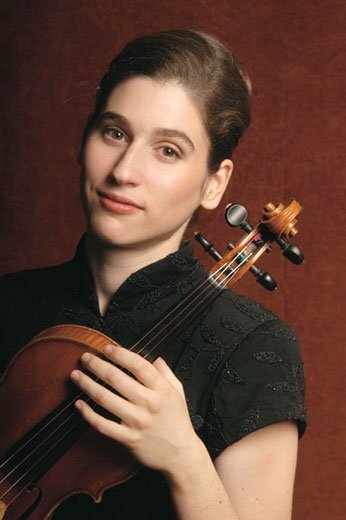 Soloist Sharon Roffman is certainly a favorite of BCO (much was made of Roffman’s appearance with the ensemble for the third season in a row) and tomes can be written about the young artist’s considerable talents. Roffman’s Beethoven on Saturday was blithe yet substantial, a musical force that reads a profundity into the work while remaining sensitive to the exquisite delicacy of the line. Roffman’s self-composed cadenzas epitomized these aspects in a technically and thematically complex line somehow kissed with a stylus phantasticus whimsy— truly a major highlight of the evening. Certainly, Roffman should be commended for sustaining a solo line against the thick lower voices in BCO’s Saturday evening performance, but discrepancies in tempo presented challenges, as an eager soloist battled the conductor, resulting in tense, unsteady passages. In addition, issues with tuning, particularly evident in the early movements of the concerto, presented major obstacles. Yet despite the venue, BCO’s musical statement was not lost on a rapt audience: practically every movement of Saturday evening’s performance was received with warm applause, culminating in an enthusiastic standing ovation. In comments prior to intermission, conductor Steven Lipsitt celebrated the ensemble’s close relationship with its listeners, reiterating a commitment to playing music its audiences had requested. Following his talk Lipsitt led BCO in the “Christmas Song” (Chestnuts Roasting on an Open Fire). BCO continues its season on December 9th with a Boston Pops-style family-friendly concert in Faneuil Hall. Many of us in the musical community are grateful to BMInt’s commitment to review concerts that might otherwise go unremarked in print. But there is a murmur of concern, growing to a grumble, about the amateur level — musically & journalistically — about many of the reviews. The editors’ decision to send an amateur choral singer to review a professional orchestral program is not even the issue. This soloist did something Saturday night (& again Sunday at the repeat concert) that perhaps a dozen violinists in North America could pull off: she gave her listeners a fresh, impeccable, spirited, imaginative reading of a masterpiece, full of poetry, wit, warmth, and her own brilliant cadenzas to boot. The skilled and generous musicians of the BCO (many of whom also play with Boston Lyric Opera and in chamber ensembles) gave her an expert hand-in-glove “accompaniment” (really a collaboration) that few chamber orchestras could match. The only concerto performances I have heard at this level were Sherman Walt’s Mozart Bassoon Concerto with the Tanglewood Fellowship Orchestra & Seiji Ozawa, and Yo-Yo Ma’s Haydn D-major Concerto with the NY Philharmonic & Kurt Masur. Matters of balance & tempi are of course my bailiwick, and I’ll take the heat for any quibbles, though I think a perusal of the scores would suggest how & why decisions were made… The many professional musician colleagues in the audience (not to mention other experienced concertgoers, and even first time attendees) were blown away by Sharon’s work as well as the orchestra’s. The orchestra members, staff, trustees, and others are still hearing raves about the unanimity, beauty, & expressivity of the playing; the crystal-clear textures achieved in spite of a challenging acoustic; the buoyancy, freshness, elasticity, and sheer joy of the collective music-making. In politics, the saying is that one is entitled to one’s own opinion but not to one’s own facts. The maxim doesn’t translate easily to something as subjective as live performance, but I do wonder if this young man was at the same event as the other 400 people in Faneuil Hall Saturday night. Why is it that reviewers’ credentials are never questioned when they offer raves? Sudeep Agarwalla gave a generally positive review of the BCO performance, seeming to be put off mainly by acoustical issues. He also conveyed the warm feelings of the audience. I’m sorry that wasn’t enough. Lee, of course we have to take the negative reviews with the positive reviews. But so many experienced, knowledgeable listeners found this concert to be exactly the opposite of SA’s critical description. Seeing a review like this is disappointing, dispiriting, & puzzling for people who were there (and not so great for people who weren’t there). [In the concerto there was no battle; there were no tense, unsteady passages —- I could play you the archival recording…] I realize it’s impolitic of me to speak up, but when an out-of-town guest artist makes such a stunning concerto appearance (her only one in Boston this season), and a “freelance” orchestra plays at such a high, really world-class level, the experience deserves to be identified accurately. This review is most certainly not “generally positive” as asserted by this website’s creator, Eiseman. The very title “BCO Drags in Faneuil Hall” sums up the tone of this overall negative, uninformed piece, clearly written by an amateur, as are the vast majority of reviews on this site. Yes, it’s amateur hour here, and neither the talented Steven Lipsitt nor any other serious musician should pay much heed to this venue for would-be musical experts. There is an old saying that “those who can’t, teach.” In the music business one could say, “those who can’t make it in the profession become music critics.” LOL. As a matter of record, Thomas Oboe Lee has been a Professor of Music at Boston College since 1990. Doesn’t it follow from this — as above — that he can’t compose? “He who can, does. “He who cannot, teaches.” — This comes from George Bernard Shaw’s “Maxims for Revolutionists,” p.230. As a great many literate people will attest — composers included — G.B.S. was a superb music critic. He never aspired to any musical career. Boy, if Lipsitt feels this is a bad review, heaven help him if he ever gets a genuine one. Would BCO rather that it had not appeared, seriously? I took the headline also as a venue comment. As for Elli’s fatuous charge, would he really prefer that this website not exist? And Professor Lee’s fatuous and oh-so-tired shot (whose source he’s unaware of) is hardly worthy of a … teacher and composer. Much less from someone who quotes some three dozen, seriously, count’em, reviews on one of his many websites. Wow — I guess those critics must all be okay. I trust we’ll be reading astute but non-negative local reviews by both of these carpers soon. Maybe by Lipsitt too! If all critics possessed the ears, knowledge, vocabulary, style, & wit of George Bernard Shaw (or of Richard Buell, for that matter), we composers & performances would have no bone to pick. More interesting than the hoary (paraphrased) saying “Those who can’t do, teach — (and those who can’t teach, teach gym…)” is a musical hierarchy I heard from Robert Shaw, who heard it from Paul Hindemith: “If you can’t compose, perform; if you can’t perform, teach; if you can’t teach, conduct; and if you can’t conduct, administrate.” It was especially delicious because Shaw said this as he was receiving an honorary award from a music school dean! (And Hindemith’s list doesn’t reach music critics…) Aaron Copland famously remarked that as soon as a writer puts together two words about music, at least one of them will be wrong. I have plenty of “genuinely bad” reviews that I could share with David Moran, and am not considered particularly thin-skinned by my peers. The issue is not so much “good” v. “bad” or “positive” v. “negative”, but rather, is the review tethered in any way to an accurate (and ideally skilled & knowledgeable)account of what went on among performers & listeners at the event. I felt that Mr. Agarwalla’s review was unfairly dismissive of the achievements of soloist and orchestra, and was moved to rise to their defense. Of course composers & performers utilize press quotes in their publicity efforts: they are the coin of the realm (and even a stopped clock is right twice a day). I forgot to identify myself as fitting GBS’s description of a “gentleman:” a man who can play the saxophone, but doesn’t. The BCO is no BSO. From what I have heard of them, it seems Agarwala made really nice. Lipsitt did his orchestra and soloist no favors by his kvetching. Enough has been said in this thread. It is now closed. Happy Thanksgiving all.